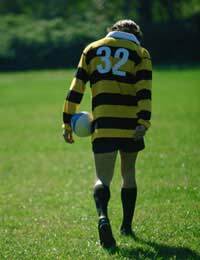 The sport of Rugby was named after Rugby School in Warwickshire back in the 1820s where historical reports state that it began when one of the boys accidentally picked the ball up and started running with it whilst playing a game of football. There are two ‘codes’ of Rugby – Union and League and whilst they have certain similarities, purists of each code will tell you that they are very different indeed. Rugby League came about after a dispute over professionalism in 1895 between a number of clubs in northern England and the Rugby Football Union. This led to the clubs in the north forming a breakaway group which eventually became what is known as the sport of ‘Rugby League’. Historically, Rugby Union has always been considered the preferred code of gentlemen or the ‘establishment’ played throughout the country whereas Rugby League gained a reputation for being a ‘working man’s sport’ mostly played in the north of England. Those class separations still exist these days but to a far lesser degree. For example, Rugby Union is still often the preferred sport for many private schools and the ‘hotbed’ of Rugby League is still to be found mainly in and around the old mill towns and industrial cities of Lancashire and Yorkshire. However, the modern professional games of both codes have tended to blur the traditional lines over recent years with teams in both the south of England and even in France, contesting Rugby League at the highest level in ‘Super League’. There have also been a number of players who have switched codes from Union to League and vice versa, especially given that both sports are now fully professional, although Union didn’t become so until 1995. Today, both Rugby League and Rugby Union are played throughout the world and is extremely popular in much of Western Europe, South Africa and in Australia and New Zealand, in particular as well as in the Far East. It is still surpassed in popularity in the USA by American Football which, interestingly enough, was also derived originally from events played out at Rugby School all those years ago. Rugby Union has 15 players on each side and the play doesn’t stop when someone is tackled. The player who is tackled must release the ball and both teams are able to contest it in plays which are commonly referred to as a maul or a ruck. However, as long as the team retains possession, there is no limit on the number of tackles they can endure. In Rugby League, there are 13 players on each side and each side has a set of up to six tackles in which to try and score. If they fail to do so after six tackles, they have to give up possession to the opposing team and the game continues with what’s known as a ‘play the ball’ situation, i.e. the opposing team start off from that point on the pitch where the sixth tackle took place and they, too, have to try and score within a set of six tackles of their own. Rugby Union has ‘lineout’ play where players from both teams jump to compete for a ball thrown between two lines of opposing players from the touchline when the ball has gone out of play which does not happen in Rugby League and, whilst both codes feature the ‘scrum’, it has far more significance in Rugby Union where it is important to try to push the other team back in order to gain ground (yardage). Do You Have to be Physically Big and Tough to Play Rugby? Long gone are the days when the biggest (and sometimes the fattest) players thrived and today, players have to be extremely athletic and fitness levels need to be very high so you do need to be in good physical condition to play the sport. Players can have a big physique but are rarely overweight for their height. However, because of the nature of the skills required in various positions in both codes, some of the smallest guys around are some of the best Rugby players in the world playing in positions like ‘scrum halfs’ and ‘stand-offs’ common to Rugby League. Union players to come in both large and small sizes too reflecting the skills that are needed to play in a particular position.Both rugby codes are heavy impact contact sports so whilst they’re not for the faint hearted, the fact that you’re aware of tackles coming at you means that your body is both physically and mentally prepared for the impact of heavy contact so, consequently, this preparation means that you’re more able to absorb heavy tackles than, perhaps, in football, which is why you don’t tend to see rugby players having to leave the field of play quite as often as you do in football. Also, unlike some other sports (and some might include football in this), because it is such an intense contact sport, it is more likely to be played in a very sportsmanlike manner as players are only too aware that even the slightest infringement of the rules can cause very serious injury, although tempers can get frayed in the heat of battle. However, in general, both codes are played in a good and fair spirit with far less rolling around in apparent agony, feigning injury which is more common to some other sports. You are bound to have a rugby club near you playing either Rugby Union, Rugby League or both codes and many of them cater for players of all ages. If you’re under 10 and curious about Rugby, many schools often introduce youngsters to Rugby by playing ‘Touch Rugby’ which has many similarities to the real sport but with heavy duty tackling replaced by a ‘tag’. It is often a good way to learn about the sport and decide if it’s something you wish to pursue further.